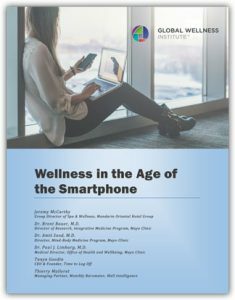 The purpose of this paper is to consider how the rise of mobile technology is impacting human wellbeing. The authors, drawing from backgrounds in medicine, hospitality, economics and technology, argue that the optimism and excitement about emerging technologies that have the potential to improve human wellness should be tempered with conservative caution that also considers the potential downsides. They look at current research on the impact of technology on sleep, obesity, mental health, relationships, safety, and productivity to raise awareness of some of the pitfalls of technological progress. They call for a greater research and policy focus on understanding the intersection between technology and wellbeing.